Taiwanese electronics giant Acer and National Yang-Ming University (NYMU) announced a collaborative partnership on Dec. 10, in which the pair will jointly develop self-driving vehicle technology. The partnership will leverage NYMU’s medical expertise and Acer’s tech talent to improve the performance of self-driving vehicles by modifying drive style according to the physiological state of passengers. 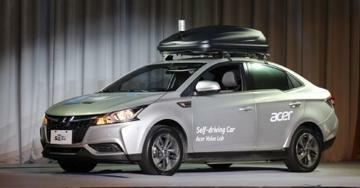 In Sept. 2018, Acer unveiled Taiwan’s first self-driving automobile in partnership with Taiwanese automaker Yulon Group and electronics manufacturer HAITEC. A major challenge facing the development is self-driving vehicles is maintaining a comfortable ride for passengers, especially in response to unexpected events. The partnership hopes to improve safety and comfort by monitoring the heartbeat, blood pressure, and breathing pattern of passengers, and this information will inform the self-driving vehicle’s driving style. Su I-chen, project manager at NYMU, said the collaboration is a great combination of medicine and artificial intelligence, and emphasized that practical medical information is important to help the machine learn and improve.